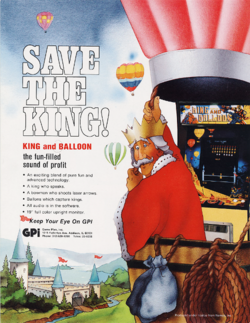 King and Balloon is a fixed shooter arcade game that was released by Namco in 1980. It was their first arcade game to feature synthesized speech, but did not do very well in the arcades as it was unfortunately released at the same time as Namco's own Pac-Man. The King speaks when he is captured ("Help! "), when he is rescued ("Thank you! "), and when he is carried away ("Bye bye!") The balloons also make that same "droning" sound as the aliens in Galaxian, which runs on the same hardware (a Zilog Z80 microprocessor running at 3.072 MHz, but this one also uses a second Z80 running at 2.5 MHz to drive its DAC for speech). The player must take control of a cannon patrollin the battlements of a castle, protecting the king (who is moving randomly back and forth below it) and keeping squadrons of descending balloon-marauders at bay. Unlike many other fixed shooters, the cannon can be hit and destroyed any number of times - it is the king who must be protected. The game is over when the King has been carried away three times, (or four, depending on whether the player had earned an extra life or not). The first round of the game. This page was last edited on 14 March 2012, at 03:53.